May 12th: Hostile artillery became active at night and caused casualties, 9 killed and 9 wounded. May 13th: A successful raid was carried out by C Company during the night. Under cover of an effective artillery barrage 2nd Lieut. Rowlerson, with 25 other ranks of No. 12 Platoon, cut their way through the wire which the enemy had put up round his posts in the orchard at Q.14.d.7.4. and afterwards cleared both the posts and the farm. Two prisoners were captured, and our party had no casualties. Congratulations were received from the Corps Commander. May 14th: Relieved by 2/5th Glosters, and moved into support. During the relief our trenches were shelled, and 6 men were wounded. May 15th–17th: At Robecq, in support. 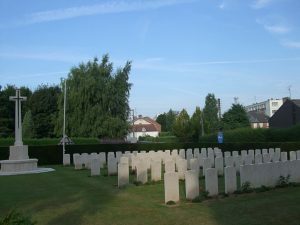 May 18th: The Battalion moved back into reserve. For some time, Avesnes was the Headquarters of the German Eighteenth Army. It was captured by the IX Corps on 8 November 1918. 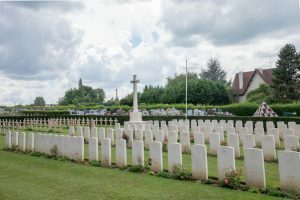 The communal cemetery was used and extended by the Germans during their occupation, and German soldiers, as well as French, Italian, Russian and British prisoners of war, were buried there. The German extension has now been removed. 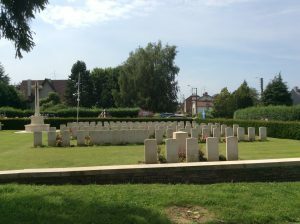 The cemetery now contains 82 Commonwealth burials and commemorations of the First World War. 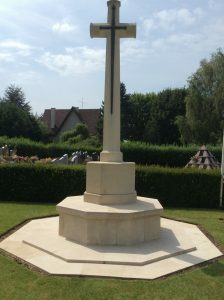 Four of the burials are unidentified and special memorials commemorate five casualties, buried in the German Extension, whose graves could not be found. There are 103 French and 5 Russian burials of the 1914-1918 war here. 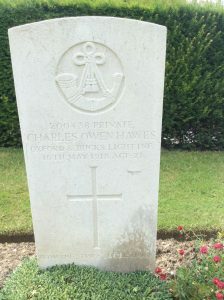 There are now a further 22 burials from the Second World War, most of them airmen.